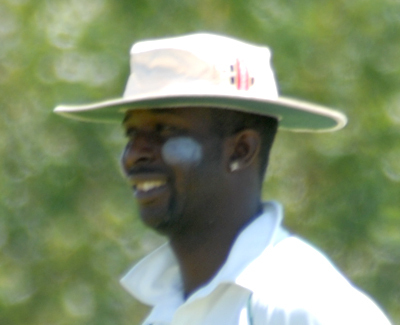 It was one of the most crucial game of the 2016 season and on a pleasant Sunday morning between Irving Whites CC and Dallas County Cricket Club 1 (DCCC1), The latter was put into bat after losing the toss. Marvin Baker and debutante Keyur Patel opened the innings, with Patel hitting his first two balls for boundaries. DCCC1 got off to a good start with both batsmen getting boundaries at regular intervals. Against the run of play, Patel was run out with the score at 65/1, at end of 10 overs. Chiranjeev Reddy was the next man to get dismissed, with Jignesh Desai walking in. Both Baker and Jiggy looked solid and in control, hitting anything loose on offer. Jiggy batted aggressively from the go and both batsmen reached their 50’s off consecutive balls. On hearing the news of West Indies winning the World Cup, Bakes did a ‪#‎Champion Dance in the middle of the pitch and continued the celebration with some quick boundaries. Right before the 30 over break, Baker mistimed one at long-off and got caught for a brilliant 80 (96 balls). DCCC1 was then 187/3 and was looking for a big finish. Aditya Thyagarajan formed a good partnership with Jiggy and both started to accelerate. Jiggy got out trying to sweep the leg spinner for a very well made 66 from 56 balls. Vinod Periagaram, whose role since last year has been to finish the innings for DCCC1, continued his form from the last game and hit a towering six over long-off, and some quick-fire boundaries. Aditya got run out with three overs to go and Dev Jivnani went in and hit the shot of the match, a huge six over long-off and against the wind. Vinod ended up with yet another half century 54* (28) and Dev 20* (8) balls, taking the total to 294/5 at the end of 40 overs. DCCC1 had the runs on the board, but considering how successful chasing has been at the Irving Ground, they knew they had to take chances and hold on to catches to pull this one off. Chiranjeev Reddy started off well with the new ball and in his second over, he got the outside edge of Kashif Ahmed, which was sharply taken at first slip by Baker. Jiggy, in his very first over got the wicket of Himanshu Sharma who cut one straight to Shail at backward point. Chiru scalped one more in his next over, with Shail taking his second catch at long off. It was a great start so far and two of the key batsmen for Irving White CC were at the crease. Jiggy then produced a great away going delivery to Murtaza who edged to the first slip, where Bakes took a blinder of a catch, diving low to his right and grabbing it with one hand inches above the ground. The big man then went off in celebration and the Champion Dance was there to see. ICC then formed a good partnership and at the end of the15 over break it was at 78/4. The job was not yet done, with a strong batting lineup to follow DCCC1 still had to bowl well and the partnership kept going well for ICC. Kirtan Patel who was playing his first game for DCCC1 was introduced and got the key wicket of Shayan in his first over, with Vinny taking a good low catch at long-on running in. Shail then took two wickets, both great stumpings by Hemanth Lalwani, especially the second one. It was some real sharp and quick work by him behind the stumps. ICC kept attacking and the equation came down to 101 off the last 10 overs. Jiggy and Aditya then took a wicket each to restrict the flow of runs, with Dev taking a good high catch at long-off and then he took the last wicket with Tannest taking a very well-judged catch right at the edge of the fine-leg boundary to give DCCC a 30 run victory. Men-of-the-Match – Baker 80 off 96 deliveries, along with two catches and Jiggy, 66 off 54 deliveries and three wickets, in addition to a brilliant 120+ run partnership. A lot was learned from the match, especially in the bowling department – DCC1 conceded 30 extras over all and extras can be a huge factor in close games. Nevertheless, a great team effort, which literally required each player to contribute at crucial moments. Final scores DCCC1 294/5 and Irving White CC 264 all out.